A New Jersey teen joined a growing movement of students speaking out against sexist dress codes with a cheeky yearbook quote. 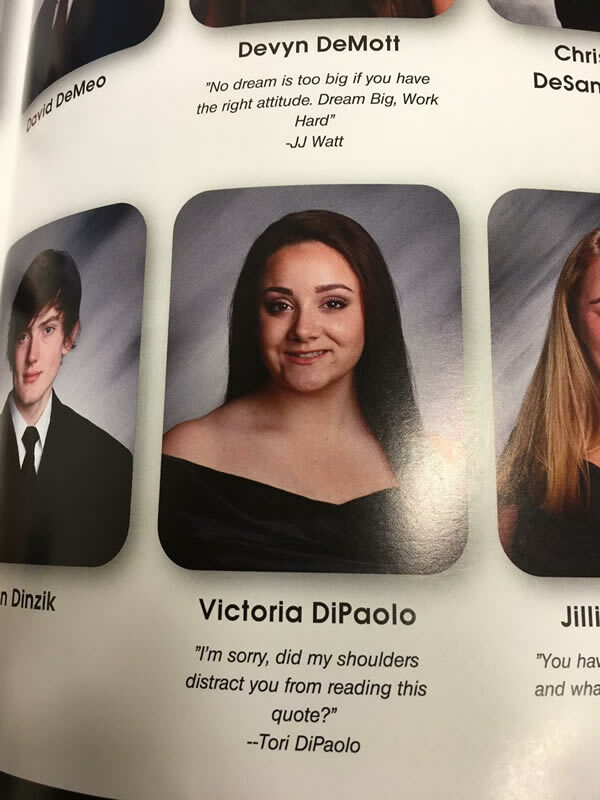 Tori DiPaolo, a senior at West Milford High School in New Jersey, dons a black shoulder-bearing top in her yearbook picture. Underneath the small photo, DiPaolo's quote reads, "I'm sorry, did my shoulders distract you from reading this quote?" The cheeky barb clearly takes aim at West Milford's dress code which, according to the West Milford public school district's website, forbids "halters, half-shirts, shorts, or sweaters and blouses that expose breasts or stomachs." 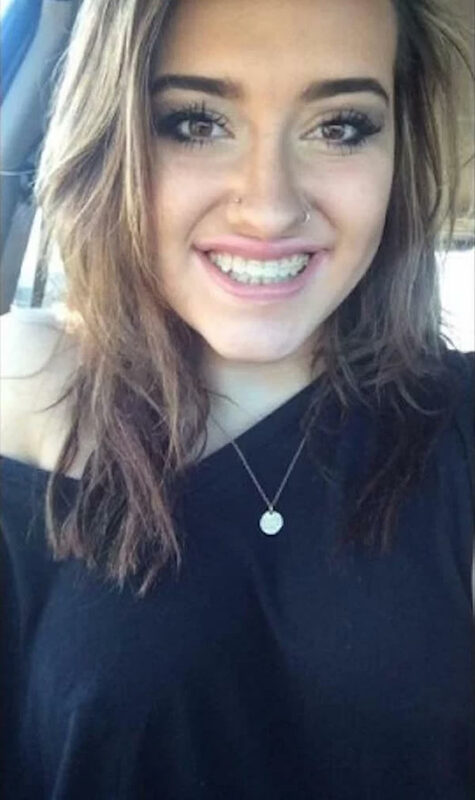 DiPaolo tweeted a photo of her yearbook picture on June 13, writing, "Tori: 1; Dress Code: 0." 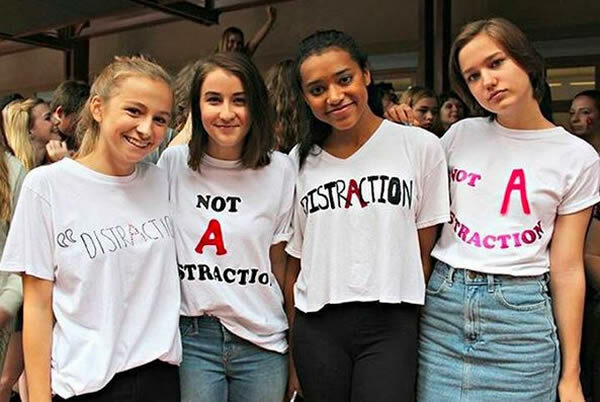 Teen girls’ bodies are not “A” distraction. Young women at Charleston County School of the Arts school in North Charleston, SC are wearing scarlet letters to school to protest a new rule stating that girls who violate the dress code must be immediately sent out of class, and cannot return until the dress code issue is resolved. Reese Fischer, a junior at the school, was one of several students worried that this new policy would disrupt students’ education. She was also concerned by remarks teachers allegedly made regarding the dress code. “The teachers at our school insert their own comments like ‘you’re selling yourself in the wrong way’ or ‘you’re asking for it,’” Fischer told The Huffington Post. Everyone is getting introduced to protests at an early age in 2017, but a group of elementary school boys from Exeter may have mastered the practice. 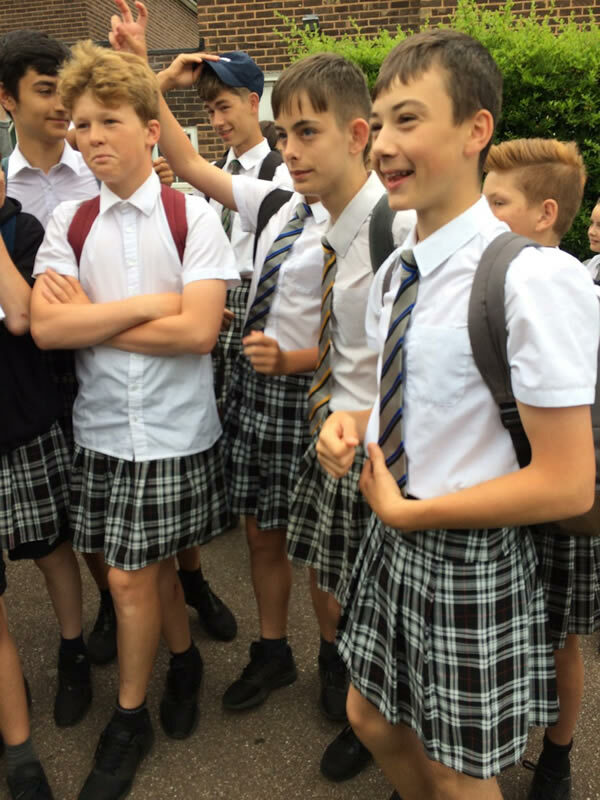 At Isca Academy in Exeter, England, temperatures have been reaching summer highs of nearly 100 degrees Fahrenheit, and the boys still aren’t allowed to wear shorts. On the other hand, the dress code favors girls during the hot weather, allowing them the luxury of skirts. So a group of 50 to 70 boys took what the rules were giving them, and showed up in the female attire. One boy added: “I’m not in sitting lessons in the boiling weather in trousers.” He also made the argument, an apt one for 2017, on the grounds of gender equality. “Boys and girls should have the same rights anywhere in the world,” he said. The boys received almost unanimous positive support from onlookers and parents, surely making an impact on the administration for the future. 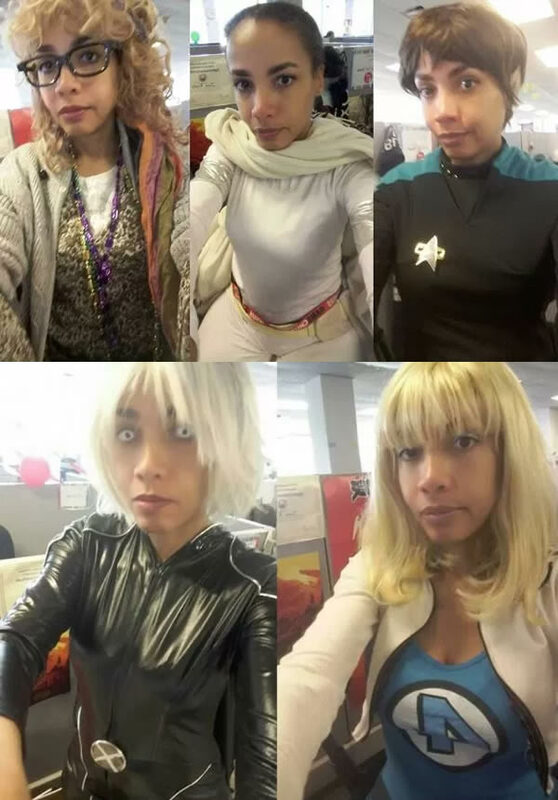 This office worker is protesting her boss’s discriminatory dress code by wearing cosplay costumes to the office every day – and, don’t worry, they all fit the guidelines. June J. Rivas, believed to be from Chicago, was recently told by her boss that the way she wears her hair in a ponytail and headscarves was ‘unprofessional’. In a Facebook post over the weekend, June explained: ‘Our contract states “No dress code. Just be clean and pressed”‘. She also shared a picture which showed how she usually dresses for the office – and there’s no doubting she is both clean and pressed. She then filed an harassment complaint. The boss responded by introducing a new dress code which banned headscarves in the office. ‘To counter, she issued a brand new memo,’ June wrote. ‘We now have a dress code. No any of above plus no straps, hats, sandals, cleavage, back out, lace, and even (and I quote) “cultural head wraps”‘. June has since reported the female boss to the EEOC – The US Equal Employment Opportunity Commission – but, in the meantime, she’s decided to comply with the guidelines. Just not quite in the way her boss probably intended. While all her outfits are within the rules, they also happen to be inspired by her love of cosplay. Well, they didn’t mention wigs, coloured lenses, spandex, or wings. Despite the fact that women have had to put up with them for decades, high heels have become a massive hot button issue recently, thanks to stories about women being sent home from work for wearing flats and a photo of one waitress’s feet after working all day in the shoes her workplace required her to wear. It feels like people are finally picking up on the idea that expecting women to wear uncomfortable, unstable shoes at all times is a ridiculously unfair, sexist concept. And helping the idea spread are videos like this one, showing a Swedish handyman named Emil Andersson doing a day’s work in high heels. It’s ridiculous. It’s harder for him to get his work done. He’s in pain by the end of the day. The more you watch it, the sillier it seems that any of us would choose to wear heels to work – and the more outrageous it becomes that there are workplaces that have made high heels part of their compulsory dress code. Because if it’s quite clearly absurd for a man to do a full day’s work in heels, why is it considered so normal when women do the same? Andersson’s day included laying a floor in a fourth floor apartment (with no elevator, so he had to take the stairs). ‘It was a real challenge,’ he told The Local. ‘But at the same time, I went for that kind of scenario. ‘I dreamed up a situation where it was hard work to have high heels on, where it promised to impact my job.’ But as he points out in the video, translated and edited by The Local, it’s just as insane for a floorlayer to be wearing heels all day as it is for a waitress. As anyone blessed with a bra size under a D cup knows, it’s often much, much more comfortable to go braless than strap a structured underwire to your chest. And when you’re more comfortable, you’re more able to focus on getting things done. So why was one student told she had to wear a bra to school – even though it was quite clear she felt better without? Student Kaitlyn Juvik was called into the headteacher’s office for what they called a dress code violation. She was told that by going braless under an opaque black t-shirt, she had made others feel ‘uncomfortable’. Which is quite clearly ridiculous. As Kaitlyn notes, you’d have to look pretty closely to even notice she wasn’t wearing a bra. Why would her natural body make people uncomfortable? And why was she made to change to accommodate someone else’s dislike of how she looks? In response, Kaitlyn was joined by other supportive students to stage a protest, ditching their bras for one school day. (Web Desk) - France’s Bus operators wear skirts in protest after being banned from wearing shorts. Bus drivers working in Nantes started this as a way to get around their bosses’ ban. With the temperatures sky rocketing up to 38 degree Celsius this week, France’s weather authority warned citizens to be “very vigilant” during this heat-wave. "This is a form of discrimination. Women drivers can wear skirts, but not the men. "In this heatwave, the temperatures are reaching close to 50C behind our windscreens. "And given we have no air conditioning on our buses, it’s unbearable." 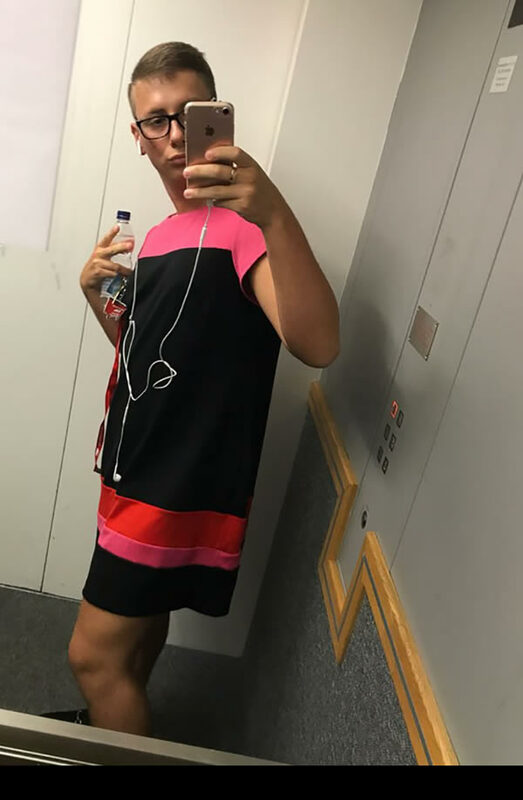 Semitan, the bus company, did release a set of lighter summer trousers for bus drivers, as reported, but it appears that they are not going to be allowed to wear shorts at work. 0 Response to "8 Amazing Dress Code Protests"